See and hear Francesca's first Vlog here How long have you been in the beauty industry? 14 years. How long have you been working at Brazilian Beauty? 14 years! I was brand new to the beauty industry when Andrew and I founded Brazilian Beauty. What do you love most about being a Beauty Therapist? I love making people feel great about themselves. I see time and time again customers walking out of the salon feeling more confident than when they walked in. Any treatment that empowers or gives women that confident spring in their step is what I love most. What is your favourite treatment to perform? 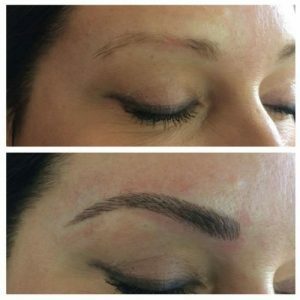 I dont do very many hands treatments these days, however I did train in Feather Touch Brows last year, which was a 5 day training course. I believe in leading from the front. I then worked in salon perfecting my technique on friends, family and a few customers who where happy for me to work on their brows. I love this treatment and have had customers cry as they are so happy with the results. Its a game changer in confidence when you go from no brows or little brows to brows that frame your face. What training courses have you undertaken? All of our Brazilian Beauty training suite. IPL hair removal, IPL Skin Rejuvenation and Advanced Facials treatments. I have a diploma in Beauty Therapy and I also hold a Diploma in Business and Management. I'm a big believer in personal development so I'm constantly reading and listening to great speakers on all different fields of science, innovation, business and beauty advancements. How do you offer your clients great customer service? I offer honest, professional advice just like I would with my Mother, sister or best friend. Its about being genuine and treating others as you would want to be treated yourself. What do you like most about working for Brazilian Beauty? I love the Brazilian Beauty team and our clients. I love that we can create special moments everyday in peoples lives. I love our brand and what it stands for, empowering people to own their own style of beautiful. What interested you about the Beauty Therapy Industry? Why did you want to get into this line of work? I wanted to be a part of an industry that helped people, that was fun and one that I thought I could improve with great systems and processes to support a superior customer experience. What do you think sets Brazilian Beauty apart from other salons? I think its the people, we have amazing franchisees and team members who all genuinely care and are passionate about the customer experience at Brazilian Beauty. Our great team spirit is the source of our success. What do you do in your spare time? I spend all my spare time with my animals, friends and family....I must say I don't have a lot of spare time! What hobbies do you have? I love beauty, animals (Andrew and I have a farm), running ( I ran my first marathon last year), cross-fit and I love cooking and eating ! Here's a picture of Francesca's before and after Feather Touch Brows, she loves her new brows so much !